We spent the first 3 or 4 hours of Day 2 at the Laura Ingalls Wilder Homestead. Now, if you're a Laura aficionado, you know that her family moved around a lot, but Pa finally settled down in South Dakota, and this is the land that we were able to visit. But first, we had to get up (not so easy)(for Chloe especially), cook breakfast, and break camp. It was totally almost exactly like being actual pioneers. Okay, so maybe it wasn't, but I think it was fun for the girls to pretend. While Joel cooked us a yummy breakfast of eggs, sausage, and pancakes, we female-folk cleaned out the tent and loaded the car. But, I digress. Once we were all packed up and our teeth and hair were brushed, we headed over to the homestead where there was much fun to be had. First, we climbed up to the viewing tower, where you can see all 160 acres of Pa's land. The prairie is so different from anywhere I've ever lived, but so beautiful in its own way. Joel and the girls on top of the tower, with their bright pink stickers saying we'd paid our entrance fee. After we climbed down from the tower (and I never knew until that moment that Chloe is terrified of heights! ), the girls, meaning Sophia, wanted to play on the little pioneer playground. There was a seesaw made from carriage wheels, which Joel was much too heavy for. Let's just say it didn't work very well with Sophia on the other end. The girls got to sit in an actual covered wagon! We saw a barn with actual chickens and cows and ponies and the girls really only cared about the barn cats and kittens. We got to play on a pump organ just like the one that Pa bought for Mary. We also saw Ma's house, where the girls made button toys and toured a pioneer dugout and a lean-to, neither of which would be too fun to live in! And then we took a wagon ride to pioneer school! and Sophia had to recite her numbers to 20 in front of the entire class. 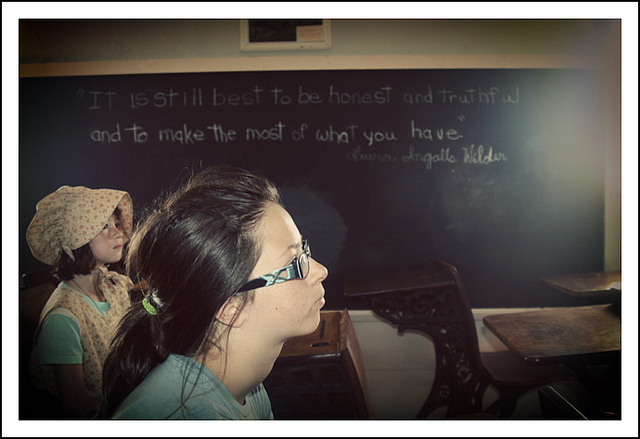 All of the children had a spelling bee, and we learned all about what school was like for the kids in the 1860s. Like, did you know they only went to school for three months in the winter? I think our girls felt like they got gypped being born in modern times, but they learned pretty quickly that the work the kids had to do at home was probably harder than what they had to do in school. So maybe it isn't all bad. On the way back, Sophia and Chloe got to take the reins of the wagon. Sophia was a little shy about it, but Chloe said "Yee" and "Whoa!" loudly and confidently, and those horses obeyed her! After we finished with school, the girls got to go on a pony ride. The pony pulling the whole outfit was named Tinkerbell, and she was hilarious. It was a super hot day (about 95 degrees) and she had absolutely no desire to be hauling kids around, so she kept turning and heading back for the stables, meanwhile banging the little carriage into the gates. The girls thought she was so funny and started to call her Stinkerbell. After the pony rides, we went into the carriage house to learn some of the things that Laura and her family did to survive. We learned how to make hay twists, which is what they had to do to stay warm during The Long Winter since there are no trees on the prairie, and therefore, no wood to burn. We learned how to grind wheat in a hand coffee grinder. We learned how to make rope, and the girls each got their own rope to take home as a souvenir. All of that was awesome, but the girls' favorite thing was making their corncob dolls. Laura had a corncob doll in Little House in the Big Woods, remember? Chloe promptly named hers Susan, just like Laura. After that, the girls skip-roped their way to the little church and we took a little tour there. We had such a wonderful time doing and seeing all of these things. After we went to the gift shop and we were eating some snacks outside on the picnic table, Chloe said, "I am so happy right now!" Which is just how these vacations should be. I'm not going to say that Chloe or anyone else was happy all the time, but the fact that she was happy right then was enough for me. I love this. So darn jealous. Corn cob doll ... truly a LIW experience if there ever was one. I never knew this existed either. So fun. Thanks for the tour! I am really jealous as well. I didn't know this place existed and now feel like I have missed out on so much. Little House on the Prairie is my all time favorite books and TV show. What memories you have made!